Mike is a character in the 3D Universe who appears as the protagonist in Grand Theft Auto Advance. Very little is known of Mike. 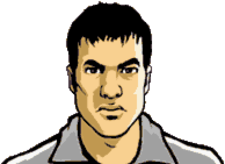 Unlike most protagonists in GTA Advance's contemporaries, Mike does not have any early background or any additional appearances in other games. It is only known Mike has intentions to leave Liberty City for good with his associate Vinnie, an initial plot point in GTA Advance's storyline. In the beginning of the game, the two had earned enough money to leave Liberty City, but Mike was been coaxed by Vinnie to take a few more jobs from the Mafia before leaving. After Vinnie was thought to be killed by a car bomb, Mike attempted to trace the killer, while attracting negative attention from all gangs in the city. It becomes apparent to Mike that Vinnie was still alive and was responsible for killing several of his bosses, as well as this he was intending to leave with Mike's share of the money. With this in mind, he killed Vinnie. Mike eventually escapes the city with a private aircraft owned by Cisco, Mike's deceased ally and leader of the Colombian Cartel. It is likely the "Mafia" that Mike and Vinnie work for is the Leone Family as conduct their business with the Mafia in Momma's Restaurante for the first five missions. Federico - Killed on Vinnie's orders. Pat - Killed for not accepting shoes made by Cisco. Rafael - Killed for trying to protect Pat. Tomas - Killed for trying to protect Pat. Georgie - Killed for trying to protect Pat. Vinnie - Killed for betraying him. Freddy - If Mike waits, Freddy betrays Mike and sends his associates to kill him, but Mike kills all the associates and kills Freddy too. Biff Rock - If the player chooses to. This page was last modified on 26 April 2014, at 09:16.